"I changed my mind about that niche" my client Claire said to me. I adored Claire. She and I had been working to get clear on her perfect peeps so that she could better relate to them. Ugh - hate it when that happens (and it happens to all of us)! We had completed the first key step creating a solid marketing plan, but she wanted to bail and start over before we got to the crucial second step. Marketing really boils down to this: GUESS THEN TEST. You do this and think that your idea will work. But then, until you TEST it out, you'll never know. All that educated guessing won't do a darn THING until you implement it. Claire and I worked through why she was wanting to shift gears all of a sudden, and at the bottom of it was fear and overwhelm. Fear of "is this right?" and "will this actually work?" Overwhelm with HOW to actually pull this off. She got stuck in her head and was thinking of a million ways to sabotage her new ideas. She was over thinking things - big time. Launching a new idea and carrying it out to fruition in a powerful way - one where you come across to the marketplace as clear yet compelling - takes commitment. And it takes a plan. Connect with prospects by phone about this new program/idea. Send out emails - how often (so she didn't inundate her list) and what to say so that they would respond. Write about her program on her website. So we dove in to all those pieces. We talked about how to do all of these and put them on a calendar so she would know just what to do when. After we were done she breathed a sigh of relief. "I totally feel as if I can do this now, Heather!" She didn't get stuck in the "guessing." She tested it out and her clients responded. She emailed me with some exciting news: "It's working Heather! I got 2 new private clients this week alone!" Woohoo! 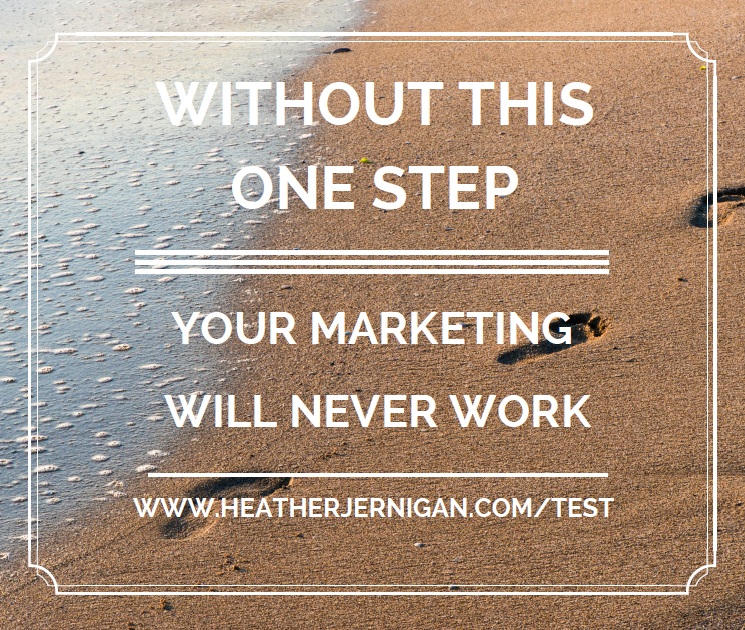 Are you stuck in the "guessing" step and finding it challenging to move to the "testing" step? I'll be announcing something NEXT WEEK to help you clarify your GUESSING and get into action with your TESTING - so you can serve more clients with grace and ease.